The provenance of works of fine art is of great significance, especially to their owner. There are a number of reasons why painting provenance is important. A good provenance increases the value of a painting, and establishing provenance may help confirm the date, artist and the subject of a painting. It may confirm whether a painting is genuinely of the period it seems to date from. Documented evidence of provenance for an object can help to establish that it has not been altered and is not a forgery, a reproduction, stolen or looted art. Provenance helps assign the work to a known artist, and a documented history can be of use in helping to prove ownership. All artworks of our Gallery come with a AAA Gallery Certificate of Authenticity and where possible, working photographs and/or a photo of the artist with the artwork and/or video of an artist in working process of creating an artwork. Lay-by is a system of paying a deposit to secure an article for later purchase. AAA Gallery offers you a four-month lay-by option on all artworks, allowing you to make regular payments towards that artwork you like. A 25% initial deposit is required with the balance paid over a maximum of four months. You will not be penalised if you prefer to pay your purchase sooner. Once you finalise the payments the goods will be dispatched immediately. If this payment method is chosen when you checkout, we will email you a lay-by agreement to organise first instalment and subsequent the other three equal payments. Subjects and Themes(Dreaming): Mountain Devil Lizard, Arnkerrthe Dreaming (Swirls), Bush Medicine Leaves. Gloria was born in about 1945 at Atnangkere Soakage in the Northern Territory. She is an Anmatyerre speaker and has 6 sisters: Ada Bird, Violet, Myrtle, Kathleen, Nancy and Jeannie. Her dreamings include Mountain Devil Lizard, Bean, Emu, Pencil Yam, Grass Seed, Small Brown Grass, Wild Flowers, Bush Flowers and Bush Medicine. Currently, she lives at Mulga Bore (Akaye Soakage) Utopia. 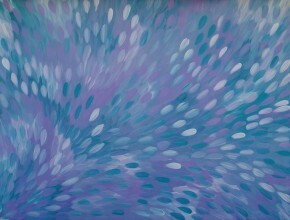 Gloria Petyarre has participated in both group and solo exhibitions since the 1980's. She has travelled to Ireland, London, Paris, USA, Singapore, Malaysia and other countries exhibiting her works. Her work is included in the collections of the Australian National State Galleries including the National Gallery of Australia, the Powerhouse Museum -Sydney, Westpac New York, Holmes Court and many other private collections. 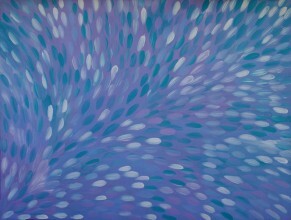 In 1999 Gloria won the prestigious art award, the Wynne Prize, for the Best Australian landscape. Gloria first gained recognition in silk batik which began at Utopia in 1978 with exhibitions held nationally and internationally. 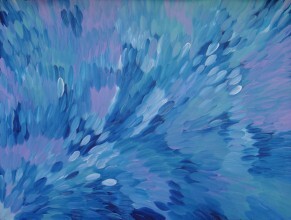 In 1988 Gloria was part of the very first group to experiment with canvas, called the Summer Project, and Gloria has since continued to work in this medium. Awelye, the women's ceremonial body paint designs, was the subject of Gloria's very first painting, she recalls. Over the years Gloria has applied many methods of enhancing the simple linear work in her Awelye paintings, including using sponges, hand work and even a toilet brush. One of Gloria's most important Dreamtime stories is that of Arnkerrthe, the Mountain Devil Lizard. 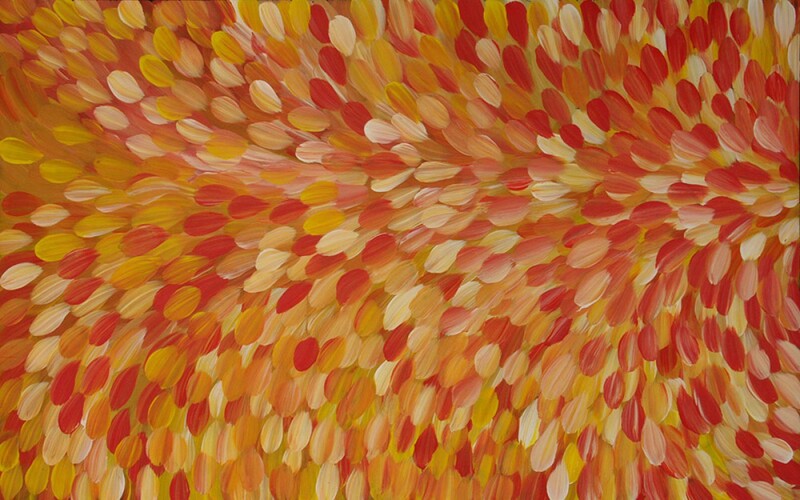 Arnkerrthe travelled over Gloria's land creating all of the people, sacred sites, songs and other Dreamtime stories. In its neck it holds a sac of ochre that Gloria and her people use for ceremonies. Gloria has developed a very popular style for Arnkerrthe Dreaming that she calls the 'swirly ones'. A unique design by Gloria, these swirls represent the thorny skin on the back of this gentle little lizard. By far the most well known of all Gloria's paintings is Leaves. In April 1994 at Mosquito Bore in Utopia, Gloria began doing something new on her canvas. "That first one. I was looking, looking. Looks like leaf, and I been put another one and another one and 'ah yeah'. First leaf." (Gloria Petyarre). Throughout the years this design has become more refined, leaves aren't just scattered on the ground but rather picked up in swift passing zephyrs, entangled in whirls of wind and swept across the landscape. 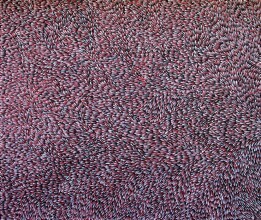 This life energy attributed to the success of Leaves, winning Gloria the very prestigious Wynne Prize in 1999, and highly recommended in 2004. The Wynne prize is awarded annually for the best landscape painting of Australian scenery or for the best example of figure sculpture by Australian artists. 1989 Utopia Women's Paintings. The First Works on Canvas. A Summer Project, SH Ervin Gallery, Sydney. Australia. 1989-91 Utopia A Picture Story. Tandanya National Aboriginal Cultural Institute, Adelaide. Australia. 1998 Dreamings, Spazio Pitti Arte, Florenz. Italy. 1999 Gallery Gondwana, Alice Springs. Australia. 1999 Mbantua Gallery, Alice Springs, Australia. 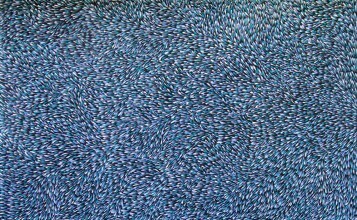 2000 Mosquito Bore The Art of the Minimalist, Ancient Earth Indigenous Art, Australia. 2001 The Unseen in Scene. Staedfische Galerie Wolfsburg. Germany. 2001-02 Recounting the Essence of Life. 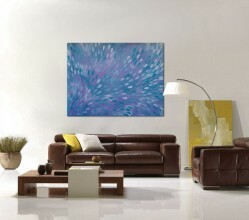 Art from Australia. Kunstforum HDZ, Bad Oeynhausen, Germany. Slaughter and May International Law Collection, London, U.K. SOURCE: Birnberg, M & Kreczmanski, JB 2004, Aboriginal artists dictionary of biographies: Western Desert, Central Desert and Kimberley Region, 1st edn., JB Publishing, Marleston. This painting represents the Leaves that were traditionally used for medicine. This practice was used long before western medicine was introdused to the aboriginal people. The bush medicine leaves are collected by the women and are highly prized for their restorative powers as part of traditional health practices. Bush medicine leaves derive from a particular native shrub which grows abundantly in the desert regions of Utopia, north-east of Alice Springs. During the life of the plant, the leaves change colour and exhibit different medicinal properties. 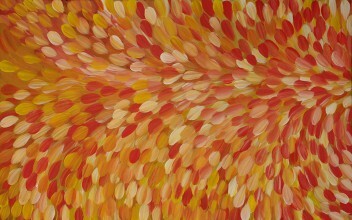 The artists who paint this story represent the leaves as they float to the ground, and they employ a range of brush strokes and colours to represent the leaves at different times of the year. When the leaves of the shrub are green they are gathered by the women and ground up using a stone. Then the medicine leaf compound is mixed with water to form a milky solution, which can be used to cure coughs, colds and flu-like symptoms. Also the medicine leaves can be collected and boiled to extract the resin, which is then mixed together with kangaroo fat. The paste that is created can be stored for six months in bush conditions. This resulting medicine can then be used to heal cuts, wounds, bites, rashes and spread as an insect repellent. The bush medicine leaves can also be made into a mixture to apply to aching joints or to place on the temples to cure headaches. Like all aspects of traditional Aboriginal culture, knowledge of bush medicine has been passed down from generation to generation over thousands of years, and is still being used today by the people of Utopia. 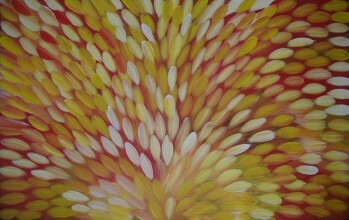 In painting the Bush Medicine Leaf story, the artist pays homage to the spirit of the medicinal plant. By creating its image the artist encourages the regeneration of the bush medicine plant, so that her people can continue to benefit from its healing powers. © 2019 AAA Gallery. All Rights Reserved.